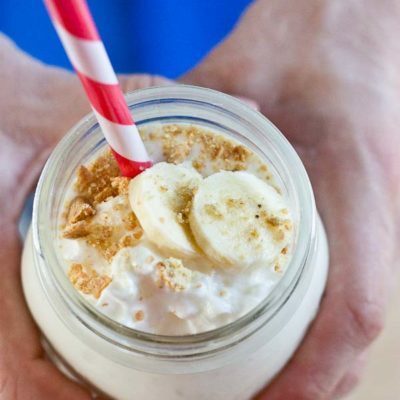 This Whipped Banana Cream Cheesecake Shake is 100% indulgent without all the guilt. 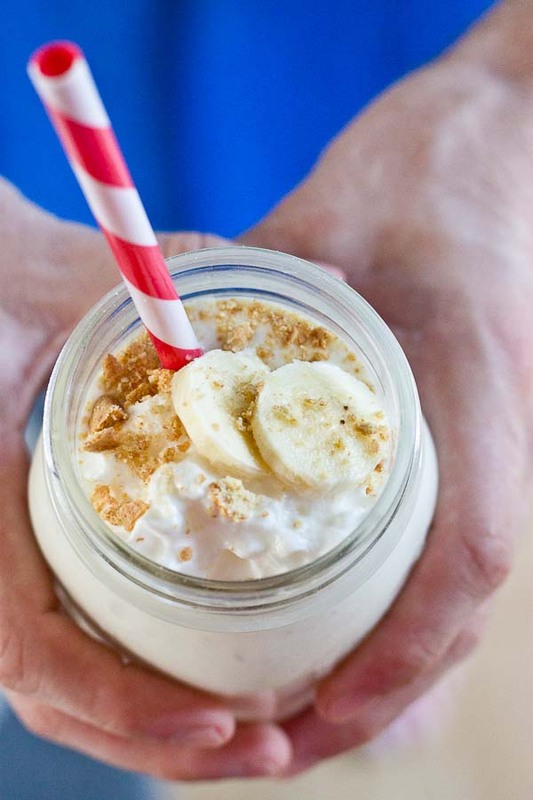 It’s high protein made with bananas and cottage cheese and no added sugar! Love this is the healthy way to eat Banana Cream Cheesecake. 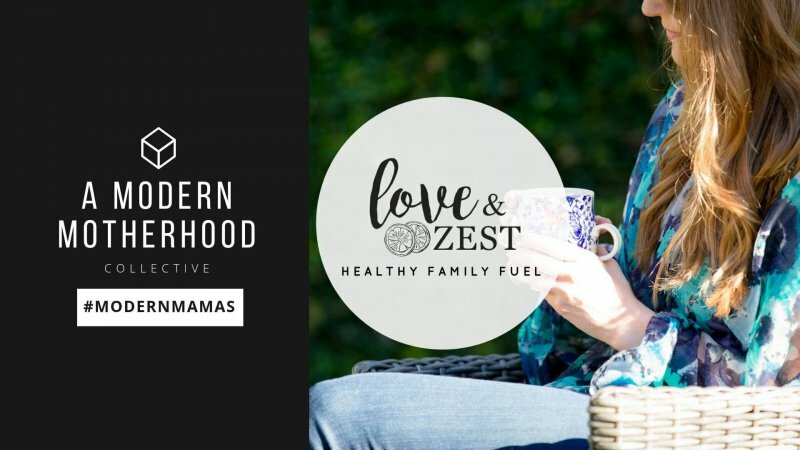 Baby must really like cottage cheese because I’ve been eating cottage cheese any way I can get it– muffins first and now smoothies! Or maybe he just likes cheesecake? You know, that’s probably it because his dad definitely has a sweet tooth. I keep dreaming of cheesecake flavored things lately. Here lately I’ve been adding cottage cheese to my smoothies. It’s so good and high protein without protein powder!! Yippee! I’ve tested strawberry, chocolate and now this Whipped Banana Cream Cheesecake Smoothie and they have all been ahhhhmazing!! One interesting quality that I’ve found with these cheesecake smoothies is they keep well overnight or for a few hours at least. Most smoothies will separate and lose the thick texture, but the cheesecake seems to hold the smoothie together making this a good one to cap a mason jar lid on it and store it in the fridge for later– read: meal prep must! 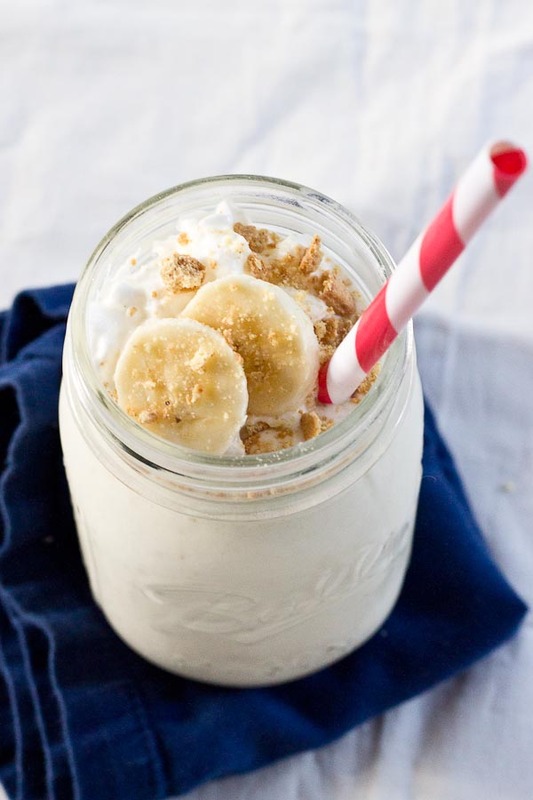 This Whipped Banana Cream Cheesecake Shake is 100% indulgent without the guilt. It’s high protein made with bananas and cottage cheese and no added sugar! Love this is the healthy way to eat Banana Cream Cheesecake. 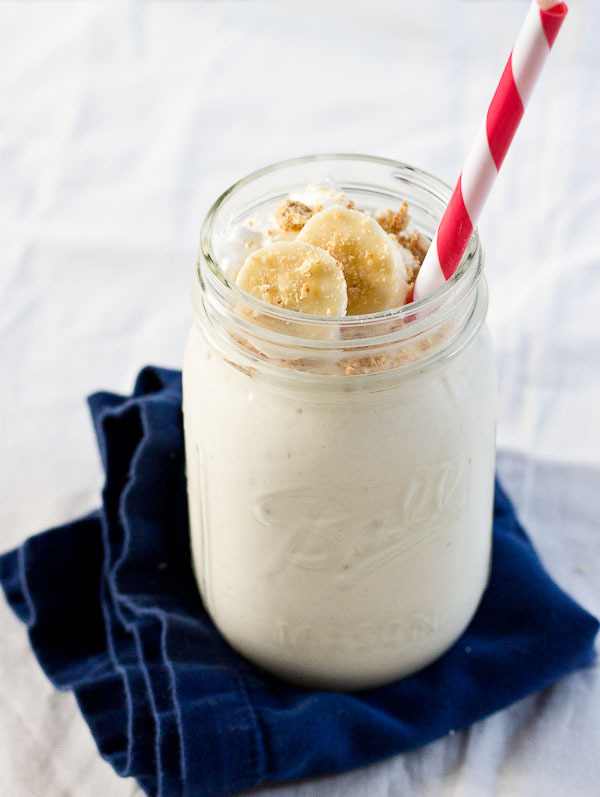 Place banana, cottage cheese, milk, vanilla, and stevia in the blender and blend until smooth. 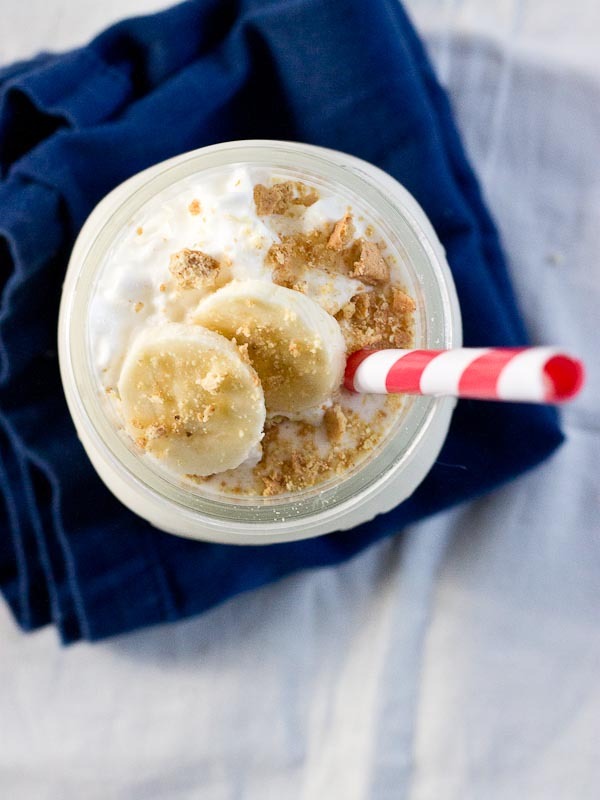 Pour into a mason jar and serve with whipped cream, sliced bananas and graham cracker crumbles if desired. I don’t like cottage cheese. Can I substitute it for protein powder ? Or can you not even taste the cottage cheese ? you can’t taste it! the banana makes it sweet and cottage cheese helps it to taste more like a cheesecake. Delicious! I added 1/2 scoop vanilla protein powder for more protein, only used 1/2 banana- very creamy! Thanks for the recipe! Oh awesome! Glad you enjoyed. It might be no sugar added but it has A LOT of sugar at 25 grams. I’m guessing that’s with the whipped cream?? YES— love to hear it Melanie. You rock! I haven’t tried putting cottage cheese in my shakes before but this looks delicious! Will try soon! You’ll love it! I didn’t like it at first for some reason, but I think I used the wrong combo of fruit with it. Baby <3's cottage cheese! Love it! My boys wanted peanut butter 24/7. I was eating it off the spoon at bedtime…. I should have made shakes instead! It’s about 90 degrees here right now and I am craving this smoothie so badly!!!! Banana Cream Pie is my all-time favorite pie so this is right up my alley! I’m feeling ya with the heat wave– can’t escape it. Well at least we can sip this smoothie and dream of a breeze and cooler temps. I never thought to put cottage cheese in a shake, but am totally giving it a try now! I know I should eat more cottage cheese for the protein and this looks like the most tasty way to do it! So I don’t even like cottage cheese right? But I figured hey why not? I didn’t have that much cottage cheese only 2 tablespoons left (it wasn’t mine). And I added 2 banana’s instead of just 1 and used vanilla soymilk. Left out the extract. But it was awesome!! It’s a weird combo, but amazing! I would have never guessed. Next time I’ll add crushed pineapple for pineapple cream cheese. Thanks for the recommended!